"""Improved this summer, this lightweight thermal protection pullover is designed for the mountain enthusiast and built for the great outdoors and a variety of weather and mountain activities. The Vector Grid pullover offers great value for the feature set. 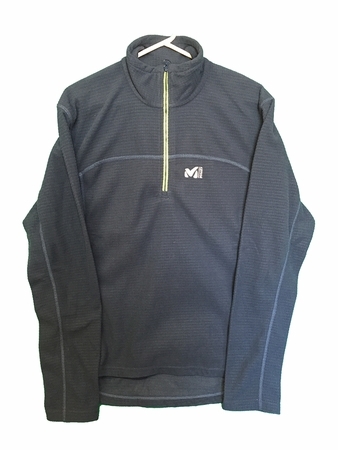 It is the classic multi-sports base layer from Millet and delivers high performance in cool environments with a soft and breathable fabric. Its Regular Fit prioritizes comfort with breathability and ease of movement. The streamlined design and flatlock construction enhance light weight and energy efficiency. The Micro Rip 3D is a soft and comfortable microfiber that can be worn next to the skin or as a sweatshirt. It is ideal for all mountain activities in cool weather. For over 80 years, Millet has been committed to designing ever more technical and efficient products. This commitment to you also serves to protect our mountain playground. Because we want the mountains to be beautiful, we are limiting the environmental impact of our activities. This jacket is rated as a Low Impact product by Millet, which means it fulfills at least one of two eco-design criteria: the use of low-impact materials (recycled, organic, Ecoya, Ariaprene, Sorona, hemp, tencel, linen, certified wool, RDS) or certified components (Bluesign, Oeko-Tex and GOTS, among others).